This week we start our new Friday Freebies series, a collection of FREE downloads from the web! In volume-1 we are featuring some special limited-time offers exclusively from Mighty Deals. Be sure to let us know what you think! 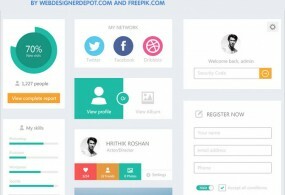 WebdesignerDepot and FreePik are offering a beautifully designed Flat UI Kit. It is one of the nicest we’ve seen! Since the introduction of mobile phones and tablets, the lines between mobile and desktop pages have merged. Responsive layout has become the norm, and Flat UI design is part of that trend. These UI Kit graphics will suit any application or web page. Here is another gorgeous UI Kit which comes from Grafpedia. The design style is in the black, light blue, and silver-grey range, but with muted tones. This makes for a classic and timeless design. 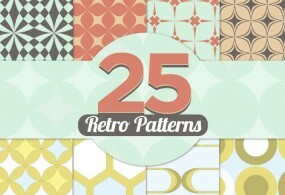 Retro refers to color and design from the 1950’s to 1970’s. Although avocado Green and turquoise blue may seem gaudy, retro rarely looks dated. The look always seems to be in style, with its warm and muted colours. Retro also offers a nice contrast to crisp and sharp modern design. These icons are designed by Vladislav Karpov are delivered as vector shapes in PSD format. They are available for personal and commercial use. There is a delightful and playful tone to these icons. Although considered flat-icons, the shadowed graphics give depth and a subtle 3D effect. 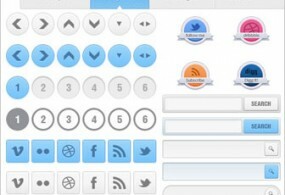 These icons could be used for a variety of web services. Here is an absolutely stunning PSD template specifically for corporate sites. Designed by Dimitar Tsankov, aka Outlinez, it’s based on the 1170 grid system. The download contains 12 PSD, fully layered and organized into folders. Unfortunately, the stock photos are not included, but it’s such a beautiful design, you could easily use your own images to suit. Nice work Dimitar! For those of you who love Apple™, here are 10 Apple Device Icons from Icon Shock. You get both AI and PNG files, so you’ll be able to modify them to your needs! There isn’t much to say here. These icons are visually stunning, sharp and crisp. This exclusive set features some of Apple’s top-selling products, from the iPad to the iPhone 4S. Readers, do you like our Friday Freebies? Do you have any freebies you would like to share? If so just get in touch with us. If they are a favorite, we will be delighted to feature them.